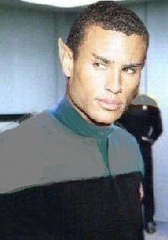 Lieutenant (JG) Solvok is the Assistant Chief Science Officer, serving under Lieutenant Victorique de Blois, assigned to Outpost 112 on Forever World. Solvok's primary job is to assist Lieutenant de Blois with the study of the Guardian of Forever. Solvok is of the race of Vulcans and possess the typical Vulcan behaviors, stoicism and logic. He also possesses the standard Vulcan mannerisms, such as raising an eyebrow when intrigued.